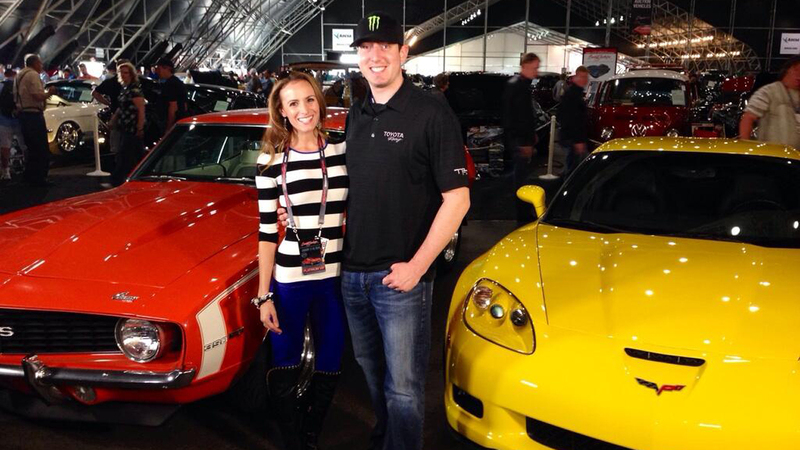 For NASCAR star Kyle Busch and his wife Samantha, last weekend was about as good as a weekend gets. On Friday, the two journeyed to the 43rd annual Barrett-Jackson Scottsdale Collector Car Auction, which this year sold more than 1,400 cars for north of $100 million. It was the couple’s first visit to the mammoth Arizona auction, and they had a great time. Friday night, they bought a vintage 1956 Chevrolet Bel Air Coupe that had been comprehensively restored and upgraded with modern running gear to make it a great cruiser. The teal and white Chevrolet sold for $99,000 with a 10 percent buyer’s premium. Sunday, Kyle sold two of his former cars, a 2006 Chevrolet Corvette Z06 and a 1969 Camaro for a total of $86,500. But the Busches weren’t there to see it. Instead, they were on the sidelines for the AFC championship game in Denver. Kyle and Sam are huge Broncos fans and the couple got to see Peyton Manning lead Denver to victory and a ticket to the Super Bowl. Meanwhile, back in Scottsdale, Kyle Busch’s dad, Tom Busch, was still at Barrett-Jackson, where he cast the winning $87,000 bid on Kyle’s behalf for a drop-dead gorgeous 1957 Ford Thunderbird in a color Ford called "Dusk Rose," a/k/a pink. Once the winning bid was secured, Kyle took his phone out, and said to Sam, "I hope you can reach the pedals in this." And then he showed her a picture of her new car. She was shocked and thrilled.